Indigenous Dayak communities are in a battle to preserve ancestral forests. GOHONG — Amidst rapidly accelerating countrywide deforestation in Indonesia, indigenous Dayak communities in Borneo, Central Kalimantan, are fighting to stave off oil palm plantations from clearing their traditional forests. In the face of national economic development plans to expedite the mono-crop oil palm business, one community continues to stand strong despite fears that they are waging a losing war. “Our struggle has not been easy. Our village is being ambushed, and we feel surrounded on all sides now,” says Anang Sugitu, 47, the village secretary for Gohong village, roughly two hundred kilometers from Palangkaraya in Central Kalimantan. Since 2008, palm oil companies such as Wilmar International a multimillion dollar agribusiness and largest oil palm refinery operating in Indonesia, with headquarters in Singapore, have been pressuring villagers to sell off their land. Gohong is one of the last remaining Dayak villages in Borneo that is still self-sufficient because of their reliance on the forest, which they use to collect food and forest products, including medicine, durian fruits, rattan for weaving and smallholder rubber planting. The 7,000-household community increasingly feels that pressure from palm oil companies is mounting. Neighboring villages, such as Sei Dusun and Buntoi, have buckled under the promises of fast cash, and often what indigenous groups and their advocates say is only partial information provided by company spokespeople. “The local communities are not consulted to give free, prior, and informed consent in negotiations. Companies do not give them all of the information they need to understand the repercussions of their choices,” says Anja Lillegraven, the Southeast Asia Program Coordinator for Rainforest Foundation Norway (RFN), an NGO focused on rights-based forest protection. With 78 percent of all the land already licensed to agribusiness as of 2013, according to the Rainforest Foundation, much of Central Kalimantan’s primary tropical forests are already slotted for monoculture palm oil plantations. As land disputes continue to complicate agribusiness ventures, indigenous communities remain one of the last major barriers to the destruction of some of the world’s most bio-diverse rainforests. At the very least, say activists, indigenous people should be given full information to make the choice whether or not to part with their land. In 2013, 8,000 land disputes were registered countrywide with the Indonesian government’s National Land Bureau (BPN), and more than half of these are related to the oil palm industry, according to Forest Peoples Program (FPP), a London based non-profit advocating for greater respect of land rights for tropical forest dwellers worldwide. “Most oil palm plantations overlap on land claimed by indigenous people. There is strong collusion between governments and companies that often ignores the original inhabitants on the land,” observes Sophie Chao, a Project Officer with FPP who has worked with forest-based communities throughout Indonesia for more than two years. While palm oil companies are granted forest concessions by the national and local governments, they often try to convince communities to give up their land by asking for them to lease to the land for agricultural production for thirty years, after which time they tell communities it will be returned to them. But national land laws state that once land is under agricultural production for 25 years, it is automatically transferred to state ownership. Additionally, in some parts of Indonesia, leases by production companies can be immediately renewed upon land sale for up to 120 years. “Once the land is taken, they will never see it again,” notes Patrick Anderson, the Indonesia Policy Advisor and an environmental conservationist with FPP. Gohong’s neighboring villages, who have sold out to palm oil plantations or had their land seized from them, face impoverishment as they can no longer use the land or forests. Abdul Muin, 43, was the head of Sei Dusun village in 2008 when a palm oil company took over thousands of hectares of forests that the community previously used to plant on. “We cannot plant, we cannot drink the water because it is polluted, and there are no more fish,” he tells The Diplomat. While oil palm companies often promise livelihoods to the communities whose land they wish to buy, the poor working conditions and low pay have repeatedly been criticized by civil society for failing to uphold labour standards. “We used to be able to send our children to school through to university. All of this has changed do to corporations on our lands,” said Nisil Tuman, 53, who hails from neighboring Buntoi village. Villagers from Gohong have seen what has happened to other villages and say they will fight until the end. “We need to stop the company from spreading their wings on our land when there is clearly no benefit to us,” said Sugitu. Those who protested in the past say they have found little support from the government. Corruption and bribery in a loose regulatory environment fuels the selling off of land concessions by local authorities. “The lack of clarity and contestation of land titles in Indonesia is the norm,” said William Sunderlin, a principal scientist with CIFOR whose research focuses on tenure, rights, and the causes of deforestation. Still, in recent years, the Indonesian government has passed a series of laws that recognize indigenous rights and the threats deforestation poses for climate change. “We have a fortunate combination of persistent NGOs, an open-minded Constitutional Court, an open atmosphere and a high-level leader who cares enough this time around,” says Nirarta Samadhi, the Deputy Head for the President’s Delivery Unit for Development Monitoring and Oversight on Forest Monitoring. In May 2013, the government declared a two-year moratorium on felling primary forests and peatlands for oil palm—a welcome step given that roughly seven million hectares of forestland have already been converted to oil palm since the 1990s, and forest coverage has continued to decline by more than 1 percent per year in Kalimantan since 2010, according to the Center for International Forestry Research (CIFOR), a non-profit scientific research organization dedication to environmental conservation. But those working closely with indigenous groups say it has not been successful in halting provincial officials from granting new concessions to companies in forested areas. “We haven’t seen change on the ground, only promises as of yet,” says Marcus Colchester, the director of FPP. “Despite a moratorium on new concessions in forests, clearance for oil palm, timber estates, energy crops and mining is intensifying,” reports the Palangka Raya Declaration, a March 2014 statement issued by indigenous groups nationwide. 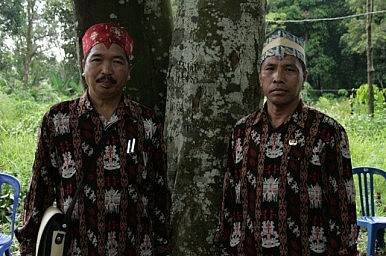 In addition, while a landmark court ruling, also in May 2013, removed the clause that all forests in Indonesia are automatically “state forests,” as previously outlined by the 1999 Forestry Law, no indigenous communities have been able to, as of yet, claim land titles and enforce their rights against the incursions of agribusiness. “It is a constitutional court ruling that needs to be ratified into more concrete regulations in order to be operational,” explains Lillegraven, noting that while many district laws do protect land rights, gaining official titles is a lengthy and complicated process that can take years in court. Conservationists and indigenous advocates are also unsure of how these goals fit with the 2011-2025 national economic development plan, which anticipates converting approximately 18 million more hectares into palm oil by 2025 in order to expand the 21 billion dollar industry. Currently the world’s top producer and consumer of palm oil, more than 2,500 palm oil companies operate in Indonesia, and in 2013 the country produced 26 million metric tons of crude palm oil. “The biggest challenge is how to achieve environmental conservation, economic returns, and social justice all at the same time,” says Yurdi Yasmi, the Forestry Policy Officer for the UN’s Food and Agricultural Organization (FAO) in Asia Pacific, who is currently working with the Indonesian government to advocate for forest conservation. Meanwhile, Gohong’s villagers says they will not stop fighting. “We cannot just sit aside and watch them take our lands,” said Sugitu. Dana Maclean is a journalist covering Southeast Asia. New biofuel subsidies are likely to have some serious environmental implications.